Power Systems Protective Device Coordination Part 5. 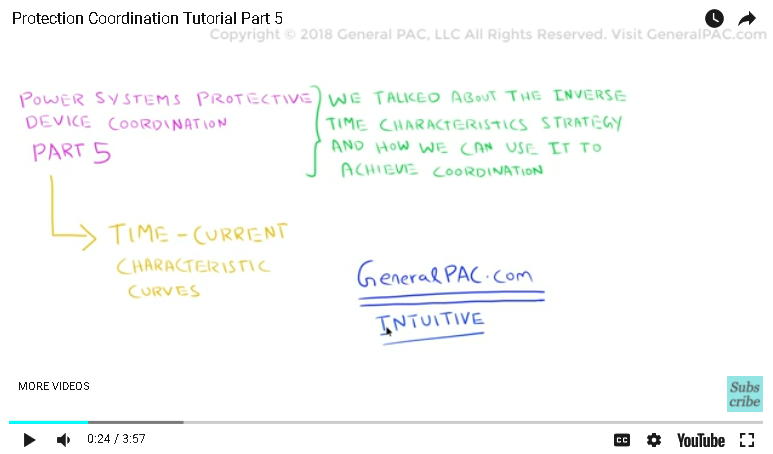 In part 4, we talked about the “inverse time characteristics” strategy and how we can use it to achieve coordination. In part 5, we will be discussing the time characteristic curves in more detail. Time-current characteristic curves are used to show the time taken by the breaker to trip for a range of overcurrent conditions. They define the operating characteristics of a protective device. The x-axis shows the current level, and the y axis is used to show the time taken by the protective device before the tripping action is initiated. 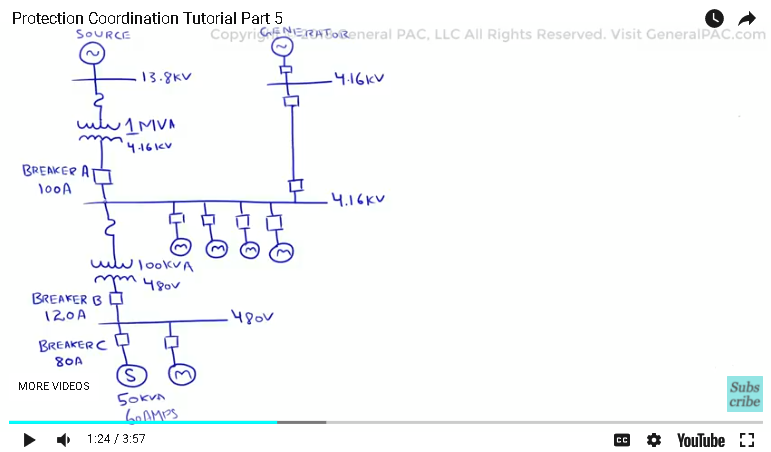 To explain this concept, let us again consider a facility with a 50 KVA, 60Amps static load. As discussed in previous parts, all breakers should be rated at some percentage above the full load amps of the downstream load. Breaker “C” is rated at 80 Amps at 480V, Breaker “B” is 120 Amps at 480 volts. And Breaker “A” is rated 100 Amps at 4.16 kV. The breaker amp rating is much greater when we compare all the breakers at the same voltage level. To demonstrate how time-current characteristic curves can be helpful in achieving coordination, let’s consider a fault between Breaker “B” and Breaker “C”. For this case, let’s assume both Breakers to be “Thermal Magnetic” Breakers. We will now plot the curves of Breaker “B” and Breaker “C” on the same axis. We can see that Breaker “B” picks up at a higher amp value, while Breaker “C” picks up at a lower amp value. This results in a shift between the curves and allows coordination. Now that we understand the basics, let’s go into more detail and talk about the different regions of a time-current characteristic curve. For a thermal magnetic breaker. There is a long-time region which starts from the pickup amp value. This region includes the protection against overloads from 110 to 120 percent of the amp rating. There is a fixed, non-adjustable time delay for each Breaker, after which, it enters the instantaneous region. This instantaneous region could begin from about 200 to 300 percent of the amp rating, and is used for protection against high abnormal currents. The instantaneous region has a very small delay of a few cycles, after which, the tripping action of the Breaker is initiated. 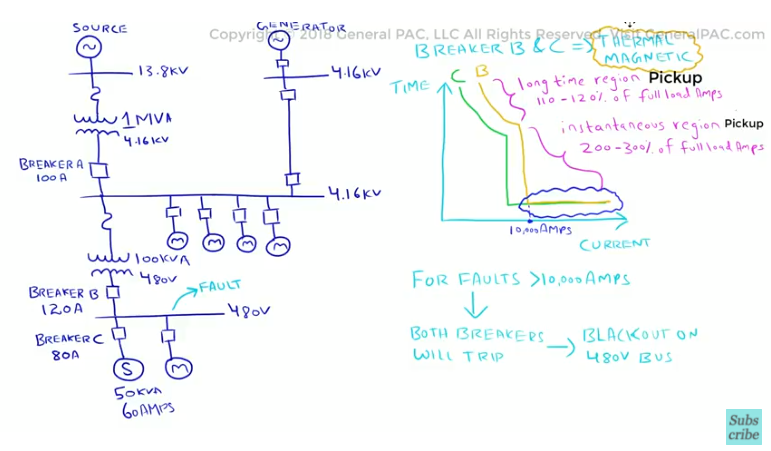 This is one way of achieving protection coordination using inverse time characteristics and the breaker amp ratings. However, there is a flaw with using thermal magnetic breakers for coordination purposes. If we look at the curves again, we can see that the instantaneous regions of Breaker “B” and Breaker “C” are overlapping after a certain current level. Let’s say this level is at 10000 Amps. What this means, is that for any fault current above 10000 Amps, there is a high risk of both breakers tripping simultaneously. This would result in a power blackout on the 480V bus. This type of overlap is particularly true for Thermal Magnetic Circuit Breakers which have a fixed amp rating, some instantaneous rating adjustment, and fixed curve. This will be discussed in more detail later. The solution to eliminating this overlapping region lies with the use of breakers with electronic trip units. Their operating characteristics are highly adjustable for ensuring better protection coordination. In Part 6, we will be discussing the operating characteristics of electronic circuit breakers in more detail. If you found this video helpful, please consider liking and subscribing to GeneralPAC.com. Thank you.